Posted September 26, 2018 by Administrator & filed under Historical Handwriting. On February 27, 1859 Philip Barton Key sat on a bench outside the home of his mistress Teresa Sickles and signaled his arrival. Key was the son of famed author Francis Scott Key, and a lawyer who served as U.S Attorney for the District of Columbia. He also had a reputation for rakish behavior and was widely regarded as the handsomest man in Washington. Teresa Sickles, meanwhile, was the wife of congressman Daniel Sickles of New York. Key’s affair with Sickles began in the spring of 1858, but it would come to an abrupt halt on that fateful day in February 1859. 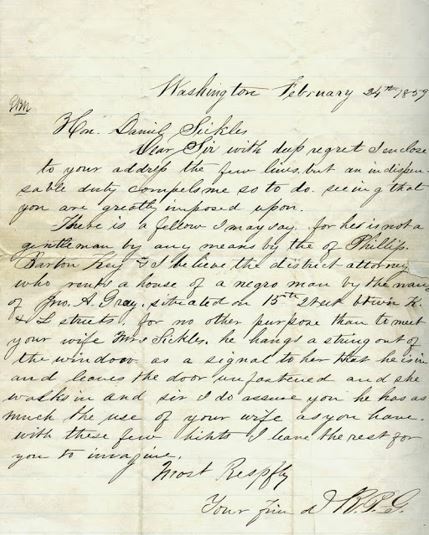 Earlier that Week, Daniel Sickles received an anonymous letter describing the details of Key’s affair with his wife. On the afternoon of the 27th, Sickles was lying in wait to catch Key in the act. Upon seeing Key on the bench outside his home, Sickles dashed outside and cried, “Key, you scoundrel, you have dishonored my home. You must die!” Sickles then fired multiple pistol shots a Key, inflicting grievous wounds that left him dead just a few hours later. Following a lengthy and highly-controversial trial, Sickles was acquitted of the murder of Philip Barton Key based on grounds of temporary insanity. This was the first time the temporary insanity defense was employed successfully in the United States. It’s also worth noting that Sickles’ defense attorney was Edwin M. Stanton, who would go on to serve as Secretary of War for President Abraham Lincoln. Although the murder case was closed long ago, the author of the letter that alerted Sickles to the affair remains a mystery. In an attempt to establish authorship of the letter, I compared it to writing samples of the four primary suspects: Samuel Butterworth, Stephen D. Beekman, Rose O’Neal and Henry Wikoff. It was a challenging examination process, due in large part to the fact that I was limited to digitally-scanned documents which lack the detail of original documents. Despite these challenges, I was able to analyze common writing habits like letterforms, spacings, slant and connecting strokes to determine that none of the four suspected authors were the source of the letter. Thus, the letter must have been written by a fifth suspect who has yet to be identified. 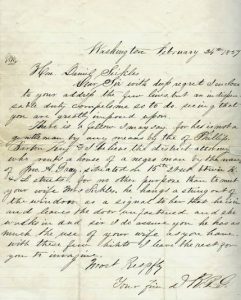 For now, the source of this letter remains one of the most enduring mysteries in American history.